I admit, I read this book because of the glowing review from Stephen King. The front cover said, “My all-time favorite…astonishing.” The back cover was covered in a much longer review, telling everyone how they’ll love this story. Young teens will love this story. Parents will scratch their heads. Everyone will probably wonder why the word “astonishing” was used. For the story itself, it was fun. The author did a great job of weaving family, friends, life, and familiar stories into the solving of a murder mystery. 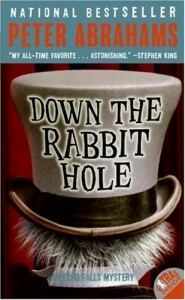 The cover also suggests tie-ins to Sherlock Holmes and Alice, but neither had predominance in the story; both tales were used as slight props. Now comes the troubling part for me: cliché characters and child neglect. Reading about a rich Jewish family sitting around the house eating bagels, lox, and matzo soup was bad enough, but I was pushed over the edge of disbelief to read about parents leaving their kid for hours at a time. The first chapter starts out with the parents leaving their 13-year-old at the dentist with no means of getting home. This follows suite several times: dropping the daughter off and “oh, I’m an hour away, sorry.” So what does the girl do? She breaks into houses, drives illegally around town, skips school, and other such nonsense. Ugh. And then comes the last part of the book, where the parents give a damn. (Side note: the author did a great job of letting the reader know curse words were taking place without using “clean” curse words. The worst was ‘damn’ and ‘piss’.) The parents drop the kid off, there’s a 5-10 minute conversation, and all of a sudden the parents are honking outside. Then there’s the cat and the dog: borderline Deus Ex Machina in my opinion. I’ll give this five stars for a fun story, but I’m taking back two for making me read about a stereotypical rich Jewish family who happens to neglect their daughter.